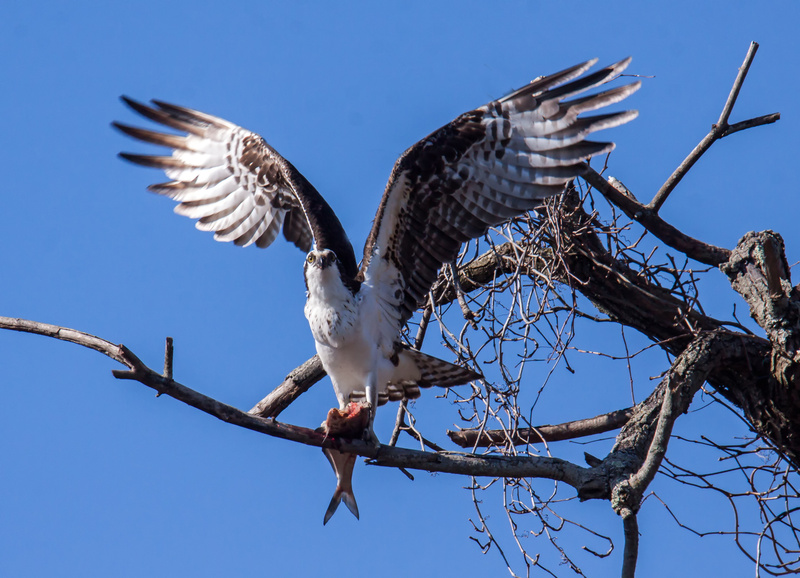 I captured this image this past Tuesday morning at Occoquan Bay National Wildlife Refuge as an Osprey (Pandion haliaetus) was starting to take off from its perch high in a tree with a partially eaten fish firmly in its grasp. I had watched the osprey consume the top portion of the fish and hope that it was carrying the remainder to its mate. I am somewhat romantic, so I want to believe that this is a story about love and sharing and caring—and maybe it is. It is also possible that the osprey is selfish and fearful and is seeking a more secluded, secure perch when it can enjoy the rest of its catch without having to worry about it being stolen by eagles or potential predators like me. Whatever the reality of the actual situation, I love the way that this image shows off the osprey’s impressive wingspan and how the v-shape of the wings is repeated in some of the branches and in the tail of the fish. I’ll go with your version, Mike. That’s a POWERful image.. the wings are like a very big V for Victory. I love how you found so many “V”s. An Awesome photo and yes I love your interpretation!